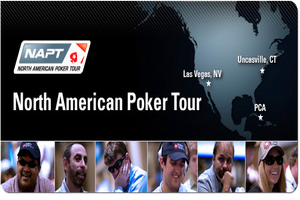 The PokerStars North American Poker Tour (NAPT) came out of the gates in Season with massive fields, and looked to be on its way to establishing itself as the preeminent poker tour in the United States; until the start of Season 2 when the tour decided to remove its name from the Los Angeles stop after talks with the California Gaming Commission—the issue was over the PokerStars name being used to promote a tournament in the US. Because of the removal of the PokerStars NAPT brand –as well as the loss of the ESPN cameras that go along with that brand—the tournament saw a dramatic decline in attendance from the year before. Now the NAPT will make its first official stop of Season 2 at the Mohegan Sun in Connecticut this weekend, so it should be interesting to see what type of turnout the tournament produces. Last year at the Mohegan Sun NAPT Main Event a total of 716 players entered the tournament which was eventually won by Vanessa Selbst –who later became a Team PokerStars Pro. With a number of online qualifiers fir the LA event needing to choose a different NAPT stop to redeem their prize package, Mohegan Sun will likely see a nice boost in attendance. But as we have seen in the past with poker tournaments; there really isn’t any way to pre-determine attendance numbers. The PokerStars NAPT Mohegan Sun Main Event kicks-off at Noon local time. This entry was posted on Saturday, April 9th, 2011 at 12:02 pm and is filed under Poker News. You can follow any responses to this entry through the RSS 2.0 feed. You can leave a response, or trackback from your own site.